When January and February roll around and if a significant freeze has occurred, this is something gorgeous to see in Central Texas, as well as many other places. 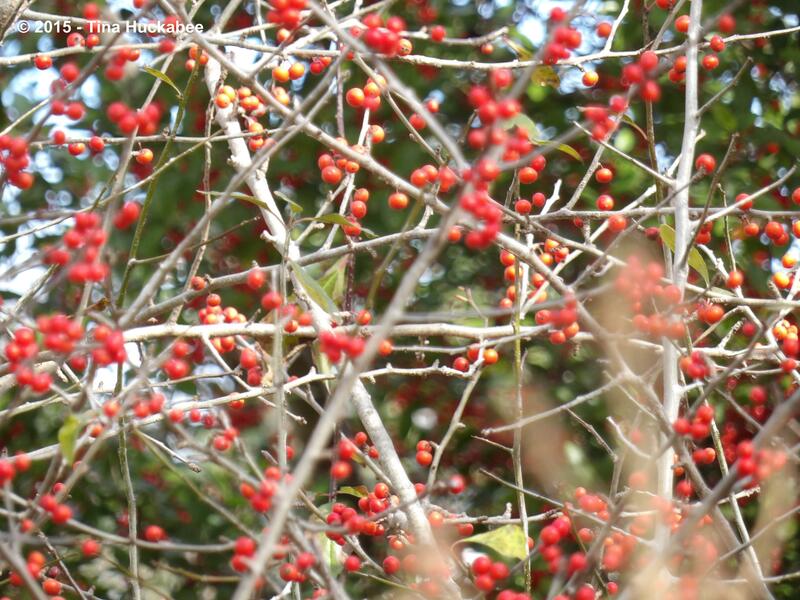 Waxen limbs decorated with luscious, red berries, this is the winter iteration of Possumhaw Holly, also known as Winterberry and Deciduous Holly. 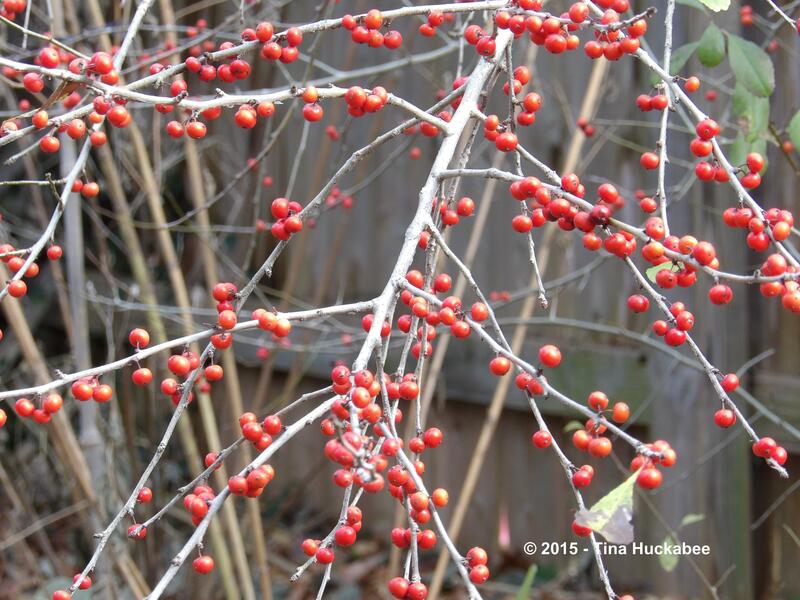 Its scientific name, Ilex decidua says it all: decidua comes from the Latin meaning decidere, to fall off. 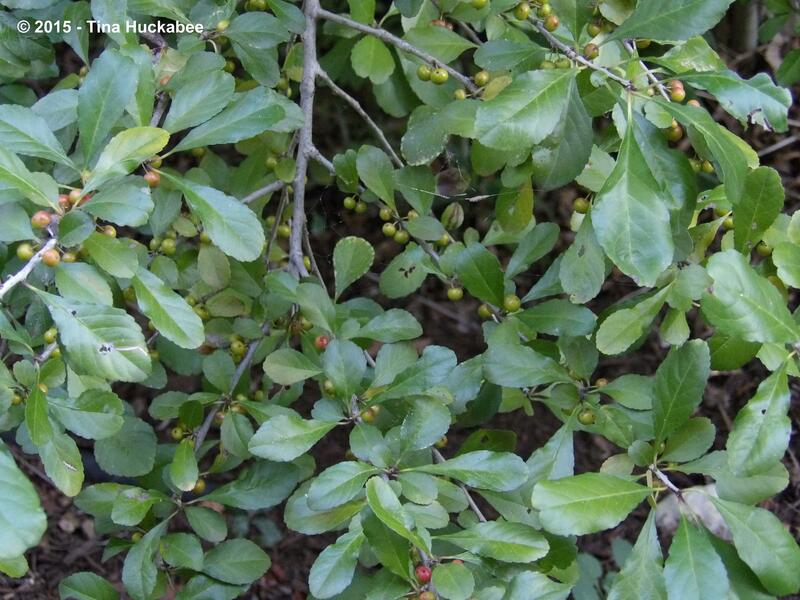 Trees which retain leaves, like the Yaupon Holly, Ilex vomitoria, in the background, are evergreen. 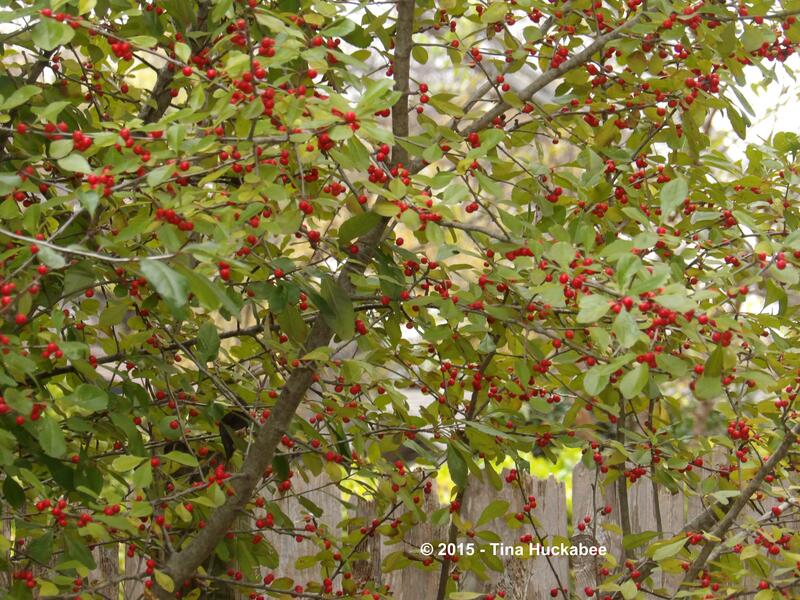 Trees which lose leaves in winter are deciduous, like the Possumhaw in the foreground. 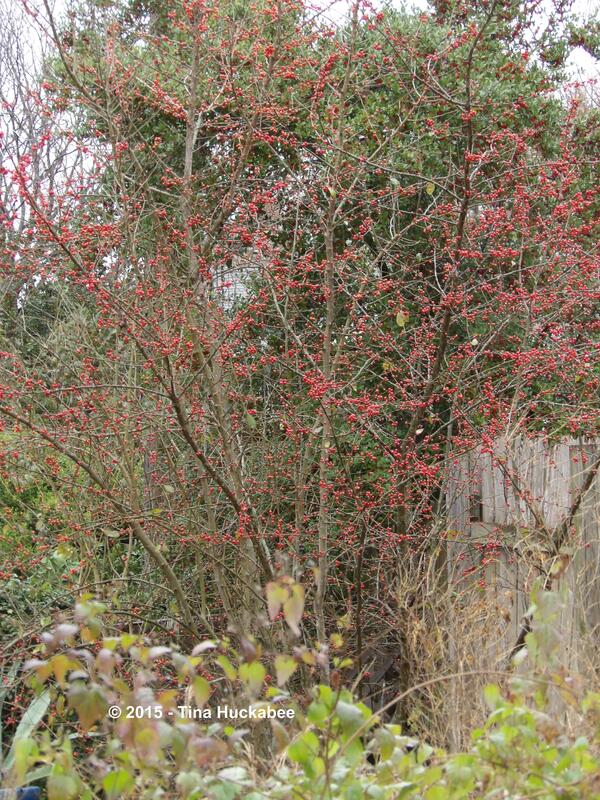 A Seasonal Look focuses on this deciduous, berrying tree, valuable for wildlife and desirable for gardeners and homeowners. 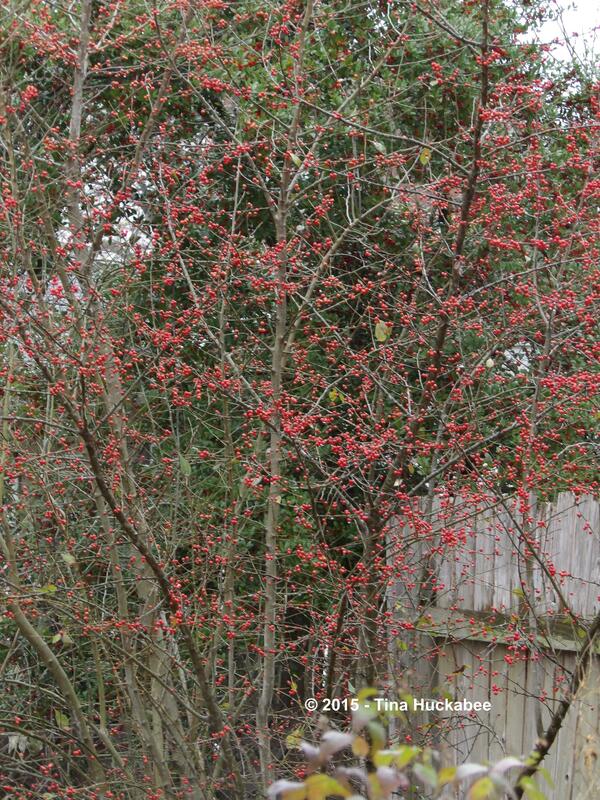 My experience with Possumhaw Holly rests primarily with the one growing in my back garden which is about 13 years old. 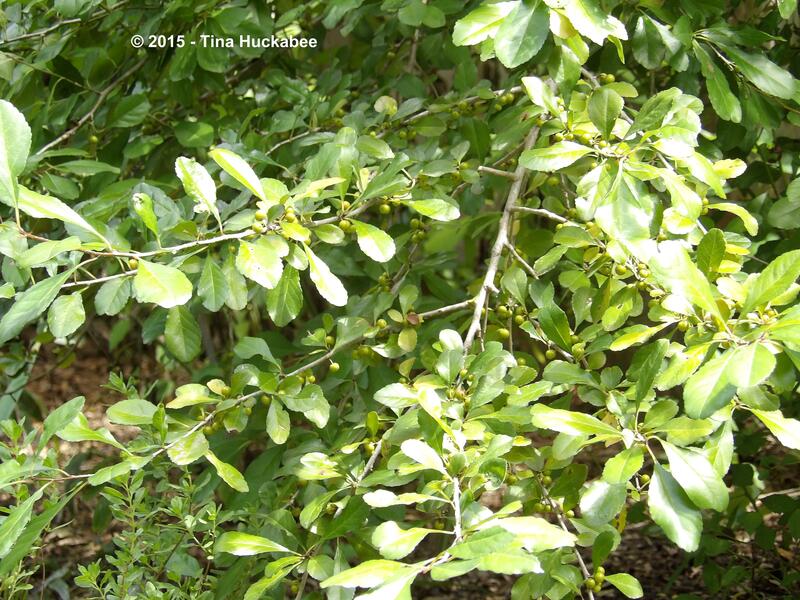 Possumhaw grows in a wide range of the continental United States–from the Southern states upwards into Illinois, in parts of Florida and Texas. 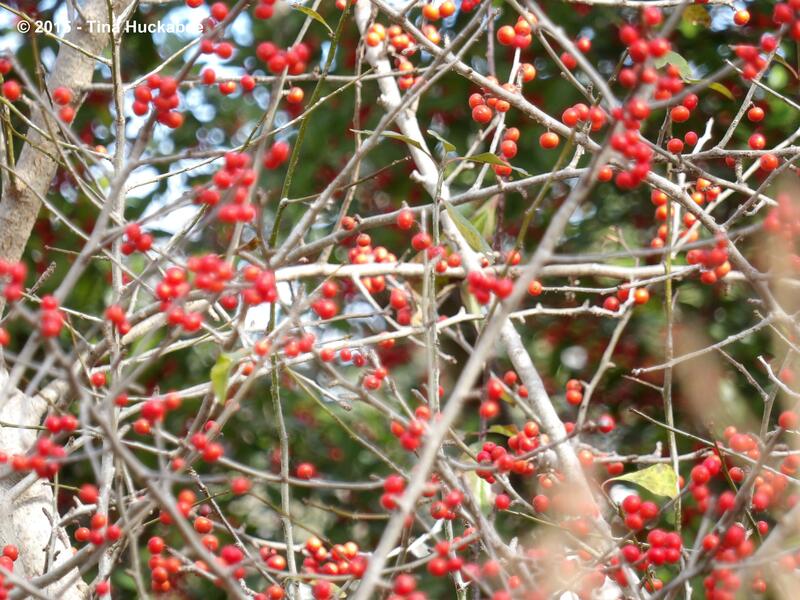 Possumhaw is common throughout Central Texas and into West Texas, but my father has one in Corpus Christi, Texas (along the Gulf of Mexico coast) which is beautiful with masses of berries in winter. It is in winter that most people turn their heads at this stunning, understory tree, but it’s an excellent tree year-round to include in the home or commercial garden. …and are sometimes stripped very quickly after ripening by the various birds which find them yummy, like Mockingbirds, Blue Jays, and Cedar Waxwings, and also by the small mammals, such as squirrels, which enjoy the tasty fruit. Some years though, the berries remain on the limbs even as new spring leaves emerge. 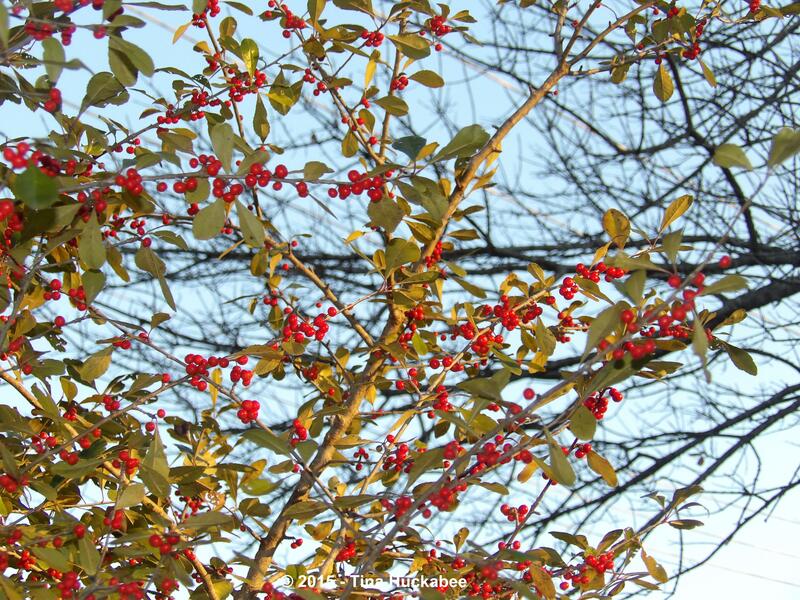 …complementing the colorful berries in winter and the bright green of new leaves in spring. 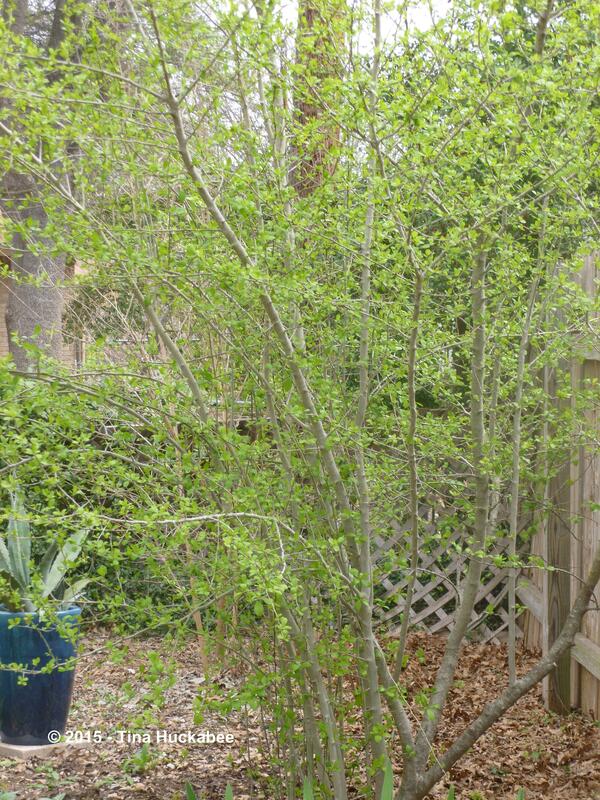 Usually it’s in March (in Austin) that the tree begins leafing out. 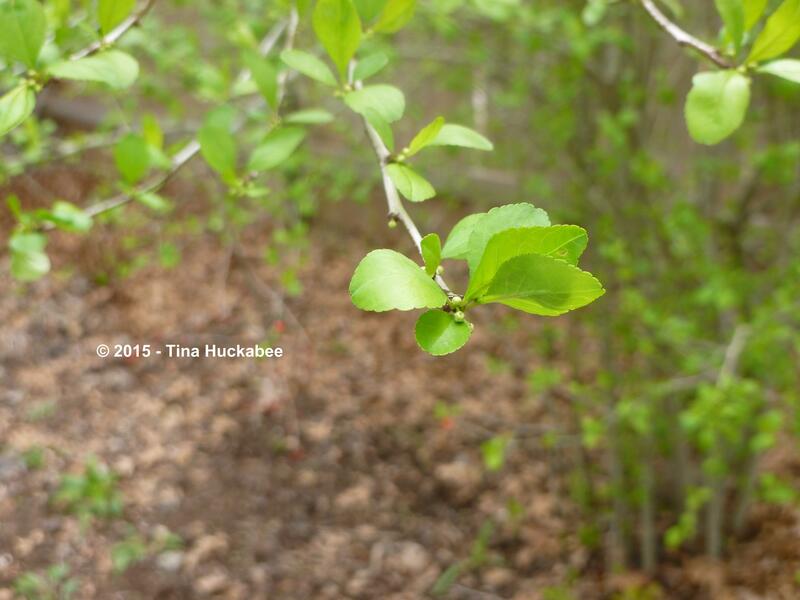 In more northern latitudes, that spring leaf flush occurs later. 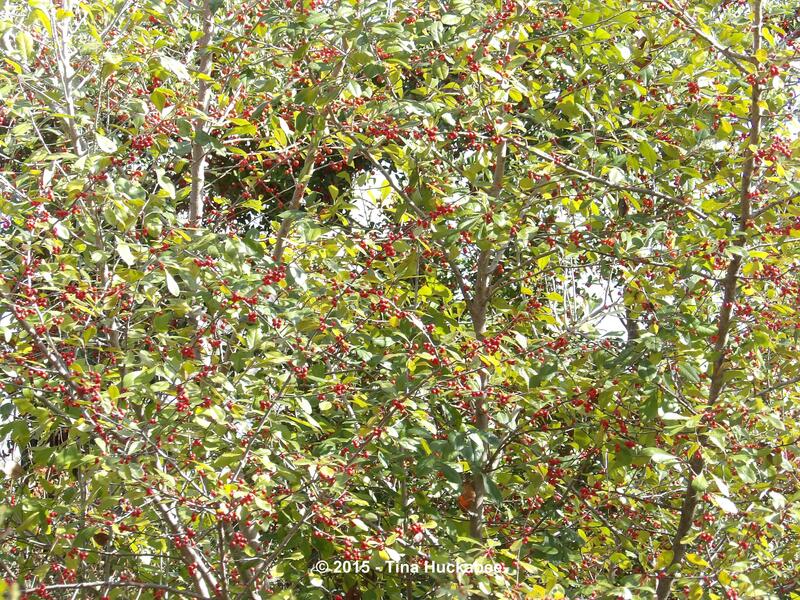 In mild years, not all of the previous season’s leaves will have dropped completely, so there are occasions where last season’s leaves and some berries adorn the tree alongside new foliage. The leaves are vibrant green, obovate, and slightly scalloped. ….and then those berries grow. 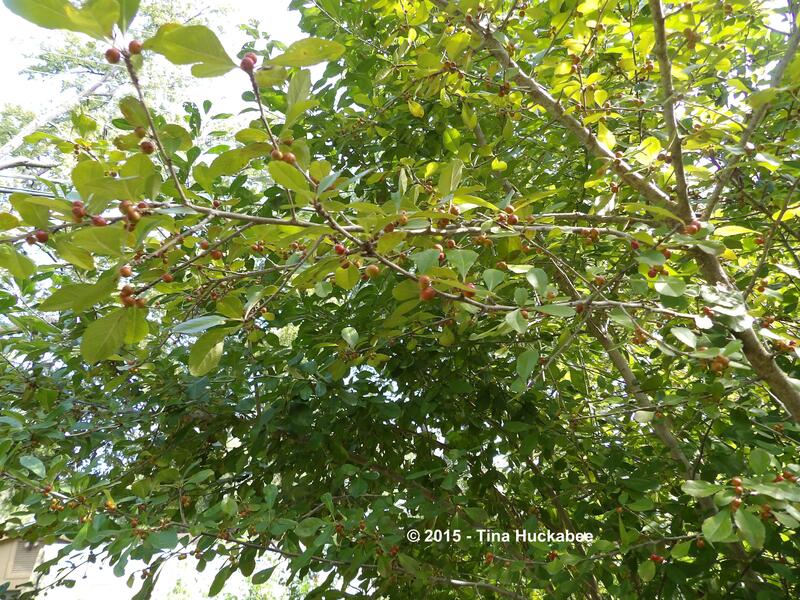 One caution, though: the Possumhaw is dioecious, meaning that the trees are either girl trees or boy trees. It’s the girl trees you want–they produce those fab berries. 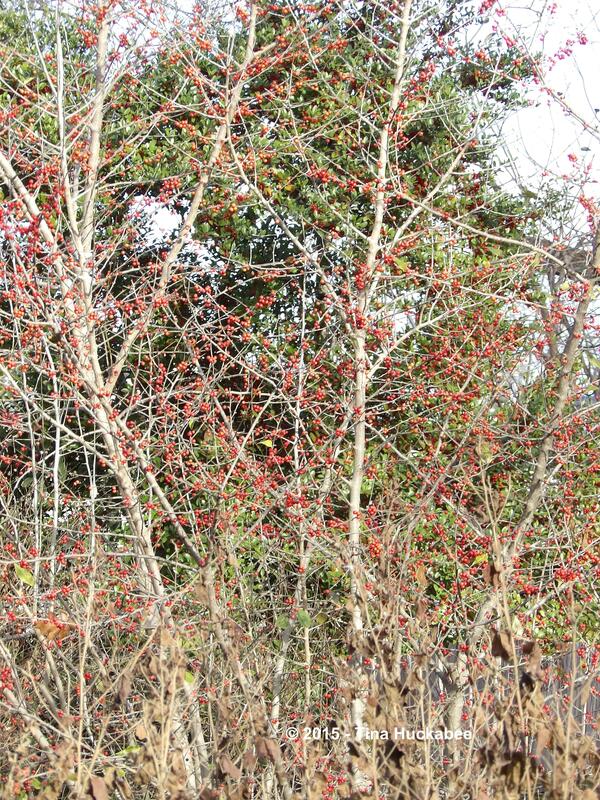 Additionally, I’ve read that it’s beneficial for Possumhaw to grow near to other berrying plants for cross-pollination to occur. 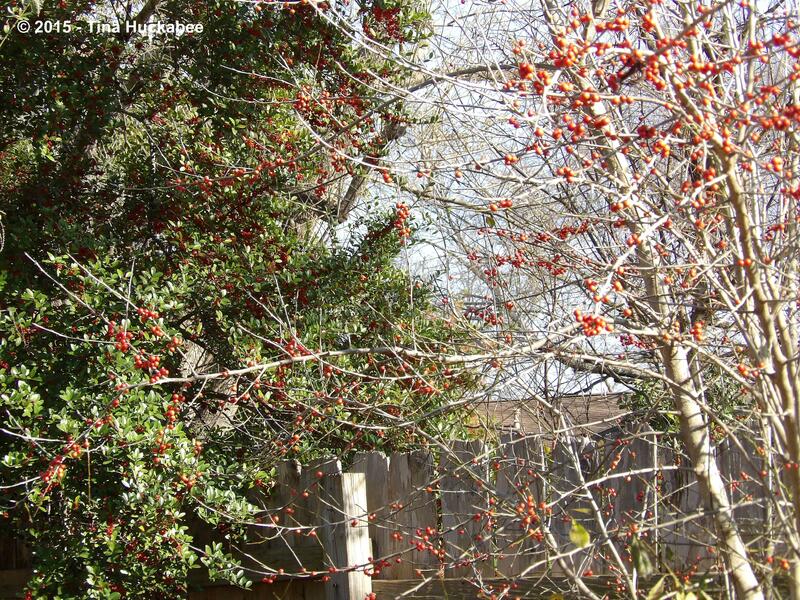 My neighbor grows another Texas native, the Yaupon Holly, Ilex vomitoria, within spitting distance from my Possumhaw.I like the combination of the two Ilex species, hanging out together in the back of my garden. 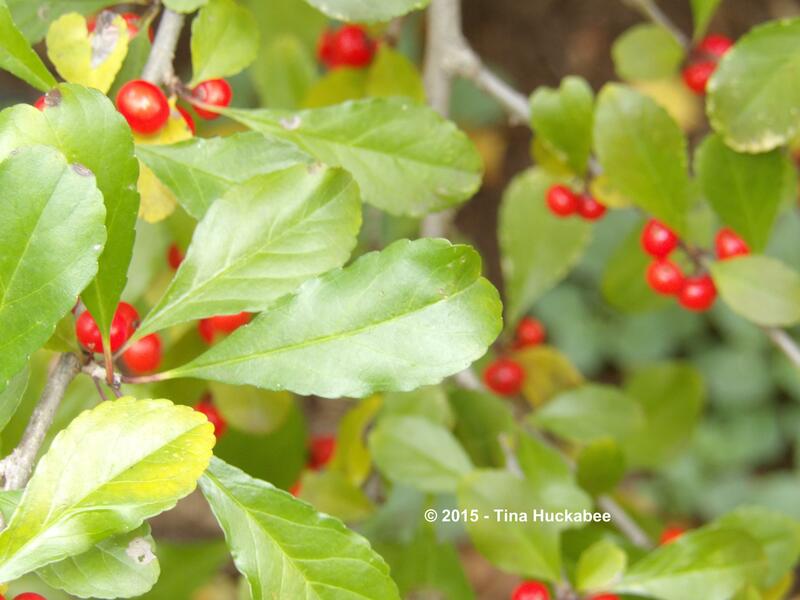 Other common garden berrying plants, like Burford Holly, Ilex cornuta, also serve as pollination partners. Possumhaw is a tough customer that handles heat and drought conditions during summer, always looking fresh and verdant. 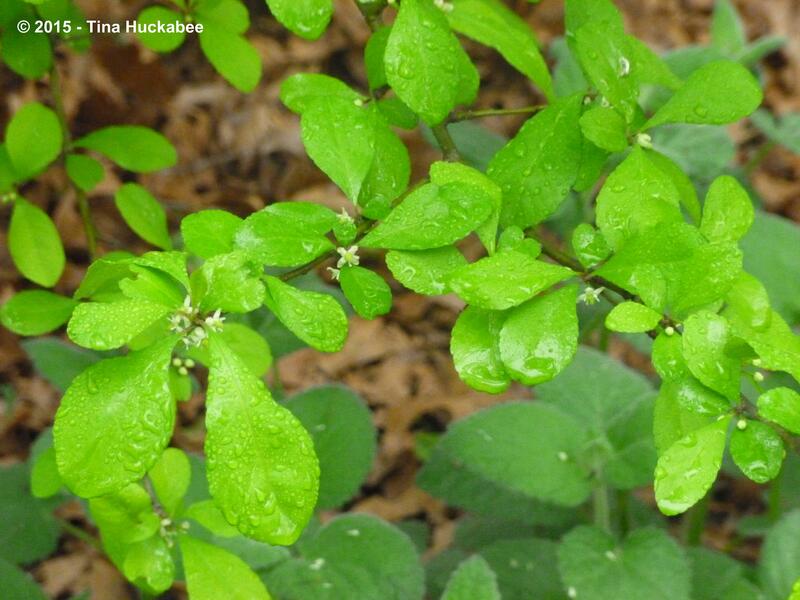 According to the Lady Bird Johnson Wildflower Center, it has “moderate” water needs–it is a plant that is often found in river bottoms, after all. Mine gets a little water by soaker hose, once or twice per month in summer–but that’s it. 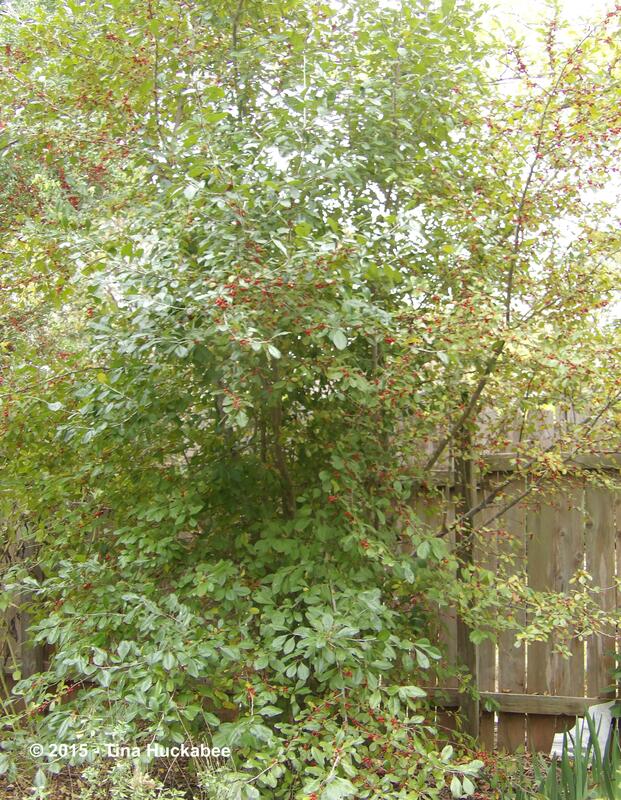 Mine also grows in decent soil and I’m a mulcher, but Possumhaw is found in a large variety of soil types, so it’s versatile and thrives in a variety of situations. …and I don’t prune often, unless a branch is broken or in the way of something else. (Ahem, fence.) 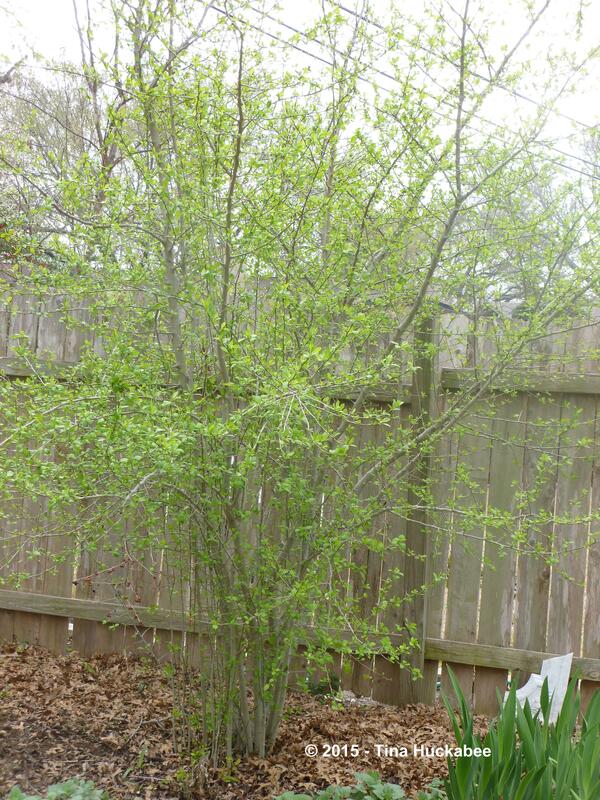 However, Possumhaw responds well to pruning and is attractive as either a multi-trunked or single trunked tree–it truly is a matter of aesthetics how you’d want your Possumhaw to look, more formal with pruning or less formal, without. …and the blush deepens with passing of the autumn months. One day, the glorious red arrives. During autumn, the leaves tend to develop into a more yellow shade of green, sometimes actually turning yellow. 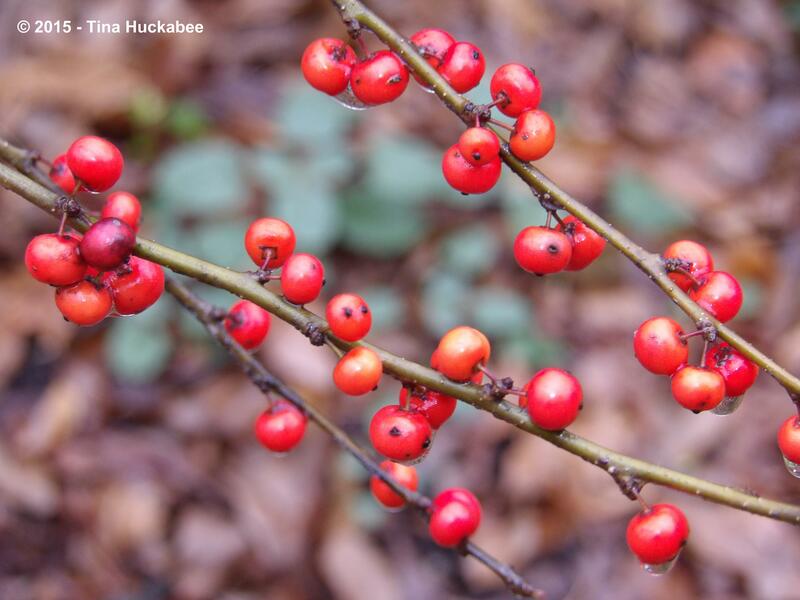 Once a hard freeze occurs and the leaves fall, it’s all about the berries! You will love this addition to your garden and so will the wildlife in your gardens who rely on this nurturing tree. 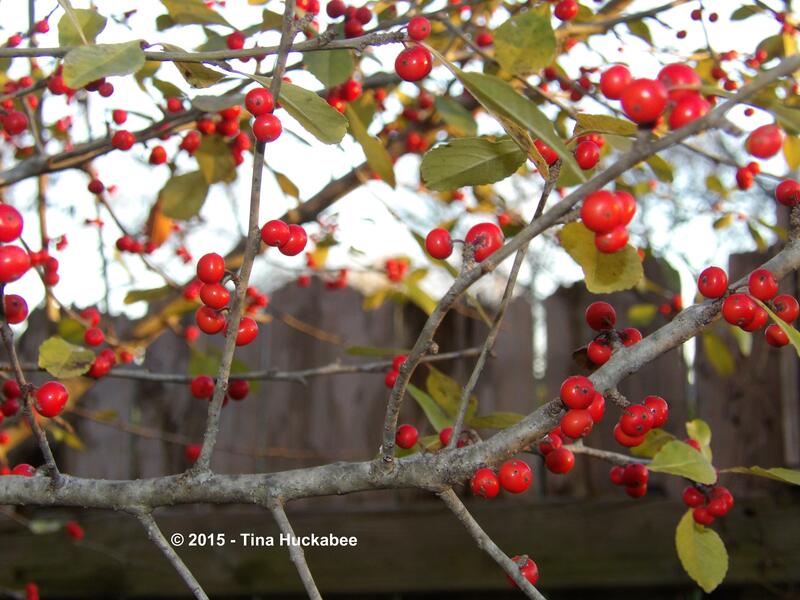 This entry was posted in A Seasonal Look, Possumhaw Holly and tagged Ilex decidua, native Texas plants, Native Texas Trees, Possumhaw Holly, Wildlife Gardening by Tina. Bookmark the permalink. Pollination partners, I like the sound of that! 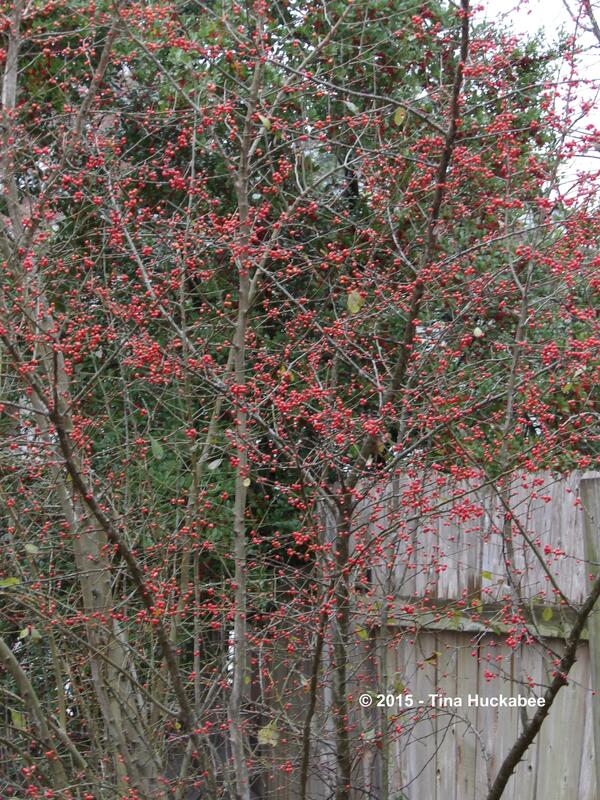 I don’t have any possumhaw but I do have multiple Ilex vomitoria (and more every year – thank you birdies!) so if I ever did get find a space for a decidua the berrying support would be built right in. It just occurred to me today how far in advance you must be planning in order to post these year round looks at so many of your native plants. Absolutely gobsmackingly stunning on your part to do so and a great service you are providing for folks who might want to know what a certain something is going to look like when it is not in full bloom or once it gets past the restrictions of a nursery pot. Just, wow! 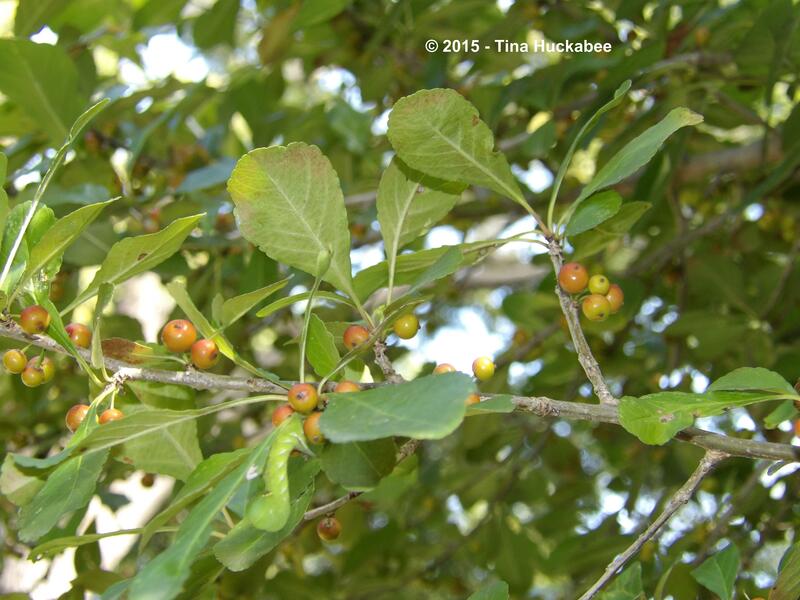 I have a small Yaupon that is growing up under the Possumhaw–as a gift from my neighbor’s tree. I’m wracking my brain to figure out a place to transplant. I’m so full up in the garden, I may just pop it in and not worry–if it looks good, fine, if not–well, why wouldn’t it be good, no matter where I put it? I’m having to think long term for The Seasonal Look series–for example, I knew I had a year of photos for this post. Once I perused the file though, I realized I didn’t really have good photos of the summer version. Just a few, but I would have liked more so I have choices on what to use. I must be very deliberate in remembering what I want to profile and then getting plenty of photos, year-round. So, yeah, that organization thing rears its ugly head. Mystery solved! I believe I have a male possumhaw growing in my bird planted garden. 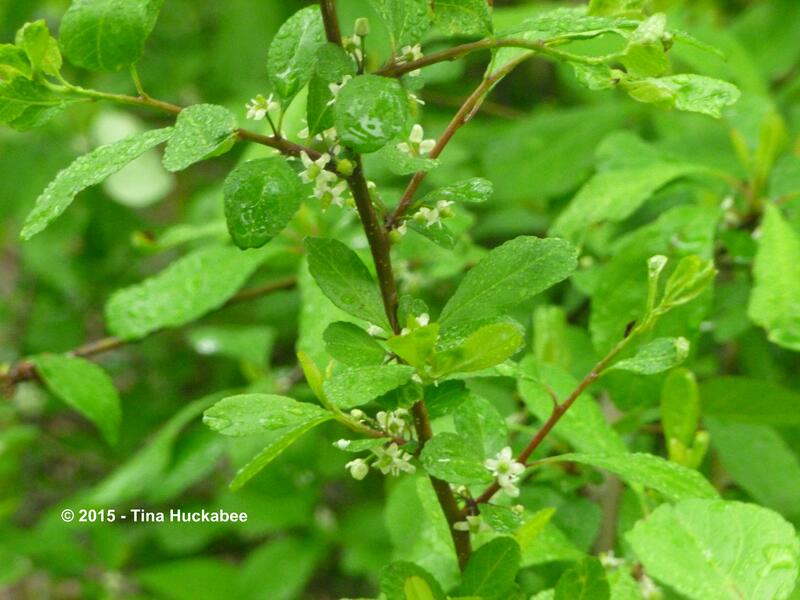 It has never fruited but the leaves look the same and they are deciduous. The flowers are tiny and scented. 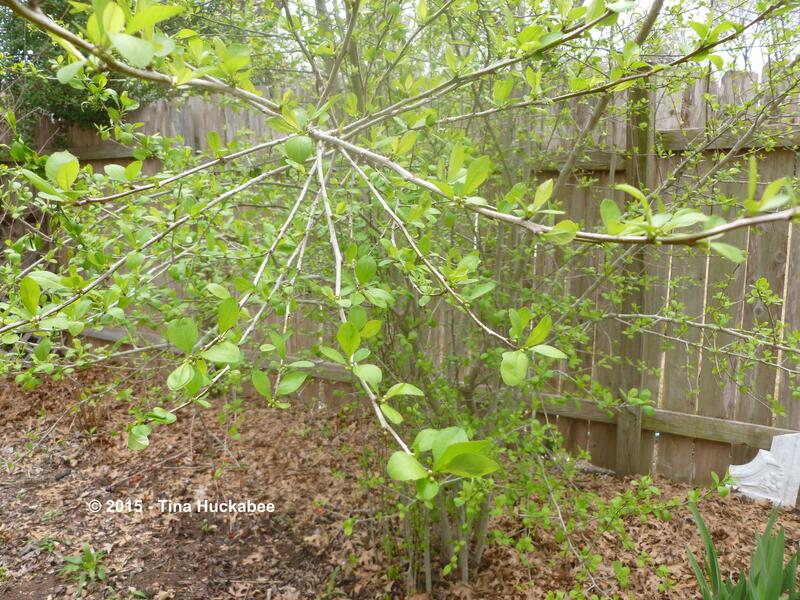 In one area the two shrubs (yaupon and possumhaw) have grown up together. The two kind of interlace creating a nearly impenetrable thicket that the wrens take advantage of for cover and foraging. As far as I can tell the two hollies haven’t had a problem sharing the space. 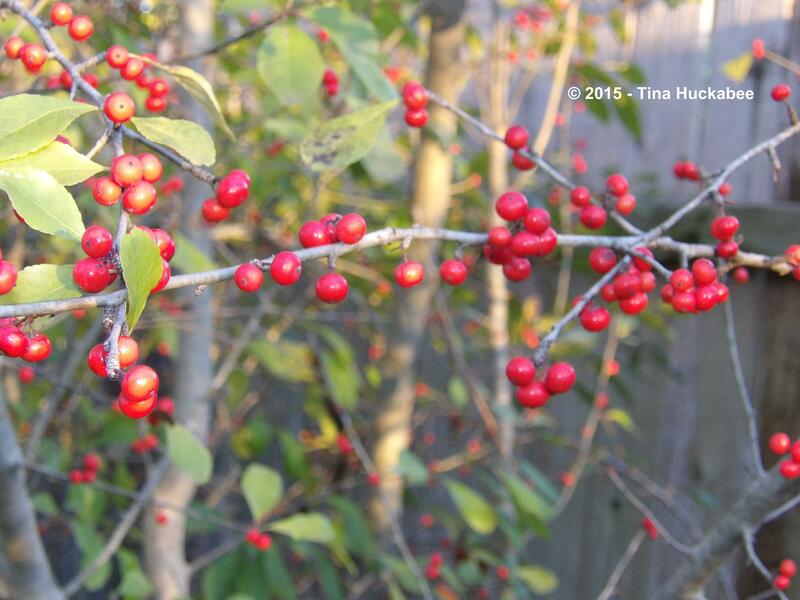 The yaupon is older and nearly reaches the powerlines; the possumhaw almost reaches the top of the fence. Interesting. I think most (probably all) Possumhaws available in the nursery trade are probably girls–those berries sell. That’s a big Yaupon, reaching to the power lines–impressive. I forgot to mention that the little flowers are scented, so thanks for that. I don’t know how old the yaupon is but it was already here in 2002. I think it is so tall because it is seeking sunlight. 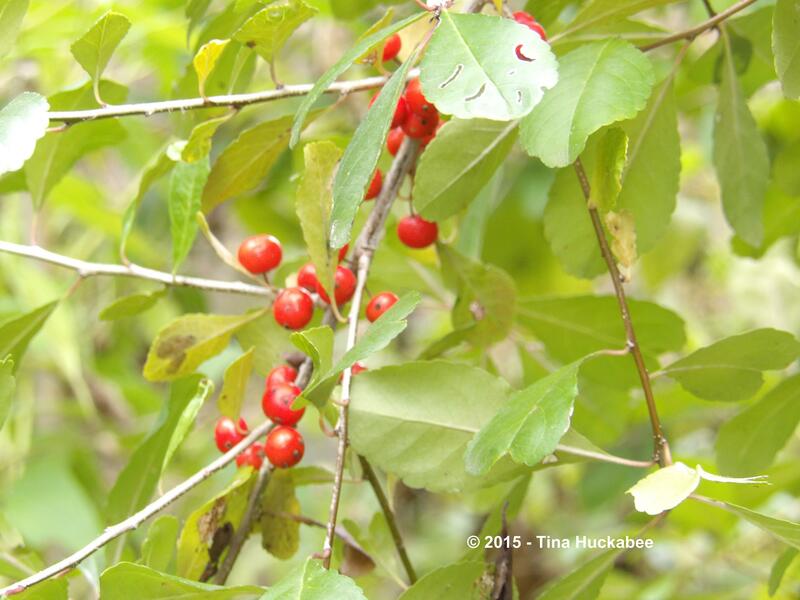 I have to say that the male possumhaw is lovely even wtihout berries. The flowers are delicate and could be overlooked but I think they are quite elegant. They would look nice in a bridal bouquet. You’re right–those delicate, dainty blooms are perfect for a bride! Let’s add some early coneflower, henry duelberg sage, and Caldwell Pink and we have part of a wedding! Great post! 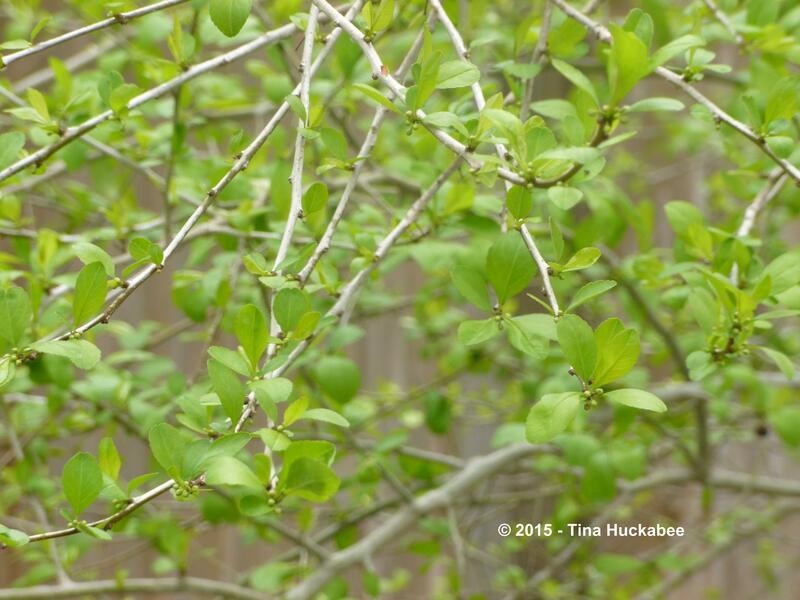 I added a possumhaw to my garden last autumn and I’m impressed so far with the beautiful foliage. Mine is just a baby plant, but thank you for showing me what I have to look forward to if the tree thrives here! Well, thanks!! Glad you enjoyed. 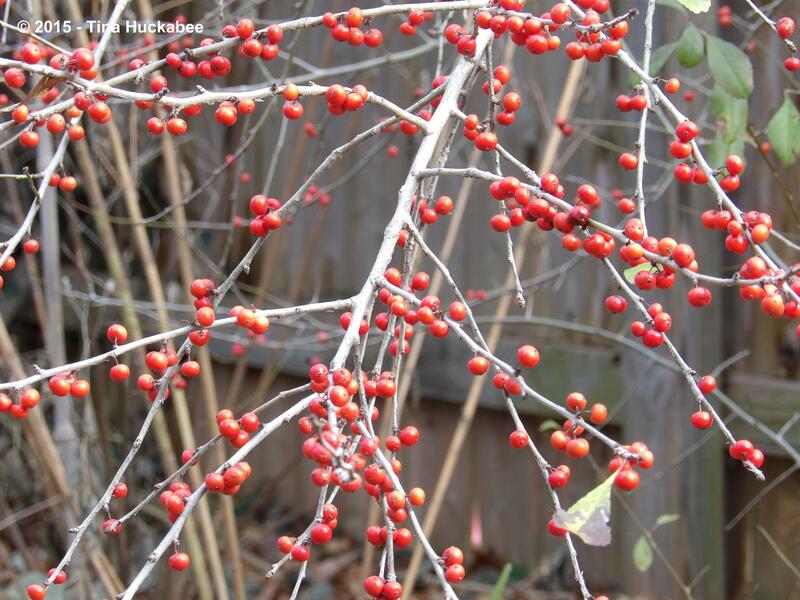 Possumhaw is a terrific plant–attractive to wildlife and people and easy to grow. It doesn’t get better than that.